Heritage, we may have a problem. 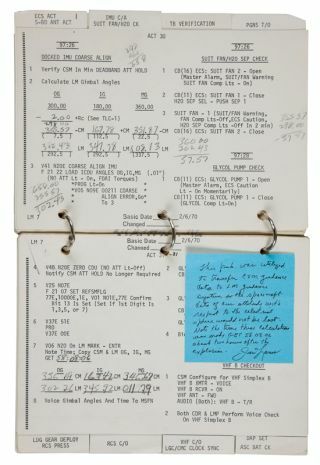 That's more or less what NASA told Heritage Auctions of Dallas, Texas recently, in response to their record-setting, $388,375 sale of astronaut James Lovell's Apollo 13 flown checklist. "NASA has made a claim against astronaut Jim Lovell, claiming that he does not have title to the checklist," Greg Rohan, Heritage's president, told collectSPACE.com in an e-mail. But the space agency interprets its inquiry differently. "We haven't filed a claim against [the checklist]," NASA spokesman Bob Jacobs told collectSPACE. "But what we have done is notify the auction house that we are seeking proof of ownership of the artifact." "In conjunction with that, we've also notified the office of the Inspector General, which would be responsible for any investigation," Jacobs said. Reached for this story, Lovell said it was inappropriate for him to comment at this time. Heritage auctioned the Lunar Module Activation Checklist during its Nov. 30, 2011 space artifact sale. The 70-page, ring-bound book was used by Lovell during the 1970 moon mission to power up the lunar module Aquarius. The spacecraft, which was intended to land on the moon, famously became the astronauts' lifeboat after a mid-flight explosion. The checklist drew the most ever paid for a mission-used document due in part to it being featured — in prop form — during Ron Howard's 1995 movie "Apollo 13" starring Tom Hanks as Lovell. "If this paperwork isn't right, who knows where we will end up out here," Hanks, as Lovell, says in the film, referring to the checklist. Heritage previously said that an "East Coast collector" had purchased the artifact, but with its ownership in question, it is now holding onto the checklist. "Heritage transfers good title on all items it sells so pending the resolution of this matter between NASA and Mr. Lovell, we have suspended the sale and are holding the checklist in our vault," Rohan said. The checklist was not the only artifact from the 200-item auction that NASA has asked for proof of ownership. "NASA made a claim against a small number of items consigned by the astronauts including Mr. Lovell," Rohan said. "The sale of those items [like Lovell's checklist] has been suspended as Heritage awaits the outcome of the dispute between NASA and the astronauts." The plate, which was one of three flown aboard the 1969 Apollo 9 mission, had been listed as sold for $13,145. The joystick-like hand controller had been bid up to $22,705. Heritage described both the ID plate and the controller as having been presented to Schweickart after the mission. A fourth artifact, a glove used by the late Alan Shepard to train as commander of the Apollo 14 mission, came from the collection of a "NASA insider" who was given it by the astronaut. The glove had sold for $19,120. In Lovell's case, he said that he found the checklist while cleaning out a bookshelf after he had donated many of his mission souvenirs to museums and given other items to his children. "I decided to put this up for auction so that someone who is really interested in this piece of history can enjoy it," he told Reuters before the sale. Rohan said Lovell believed the checklist was his to sell. "Mr. Lovell, a national hero with an excellent reputation, warranted in writing to Heritage when he consigned the checklist, that he had clear title to the checklist and that it was his to sell," Rohan said. Continue reading at collectSPACE.com about what NASA had intended for the checklist 40 years ago and what actually transpired over the past four decades.